Kieran Brady has been building for 25 years. As the only registered commercial builder in his former business partnership at BradyIPS he built and managed many complex projects. A specialist in design and construction of temperature controlled environments. More specifically, Coolrooms, Freezer rooms, Clean rooms and Food Facilities. Kieran has a reputation for quality and efficiency. 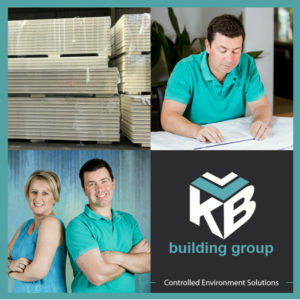 Teaming up with his wife Kylie they have established KB building group. The building of strong customer relationships is the number 1 priority, the goal being to deliver high quality design and construction of projects on time and on budget. Working with our team of experienced quality contractors KB building group can design and construct your facility with ongoing maintenance support. Our suppliers are industry leaders of insulation technology with the highest efficiency ratings. KB building group is the only contact you need when building with insulated panel, for your controlled environment solutions.